The Great American SPAM® Championship announced SPAM® Baked French Toast as the grand-prize winning recipe in the national recipe contest. 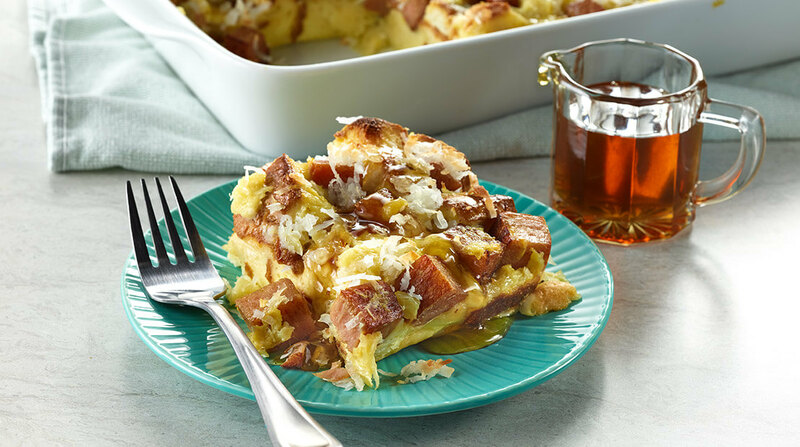 April Weinreich, who resides in Wahkon, Minnesota, the same state where the beloved brand is headquartered, captured the winning vote at the 2018 Minnesota State Fair with a Hawaiian island style French toast bake. The simple, yet delicious no fuss breakfast bake features SPAM® with Real HORMEL® Bacon, Hawaiian sliced bread, pineapple and coconut flakes. Find the recipe on https://www.spam.com/recipes/spam-baked-french-toast. Weinreich won an all-expense paid trip for two to SPAM JAM® Waikiki Festival (April 27, 2019), marking her first time to visit Waikiki, a neighborhood of Honolulu. The SPAM JAM® Festival is an annual street festival that celebrates the people of Hawaii’s love for the canned meat product. 1. Heat oven to 350°F. Lightly grease 9×13-inch baking dish. 2. In large skillet over medium heat, cook SPAM® with Bacon 2 to 3 minutes or until lightly browned; set aside to cool. 3. Spread bread cubes in prepared pan, sprinkle SPAM® with Bacon over top. 4. In large bowl, beat eggs, half & half and coconut milk. Stir in crushed pineapple and half of the sweetened flaked coconut. Pour evenly over the SPAM® with Bacon. Press bread down slightly to absorb the egg mixture. 5. Bake uncovered for 30 minutes. Sprinkle with remaining coconut flakes and bake 15 minutes or until coconut is toasted.